There's no need to even boil the pasta! 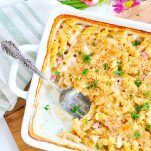 Just dump-and-bake for this easy 10-minute Chicken Cordon Bleu Casserole (a perfect way to use leftover ham or leftover chicken)! There’s no need to boil the pasta! 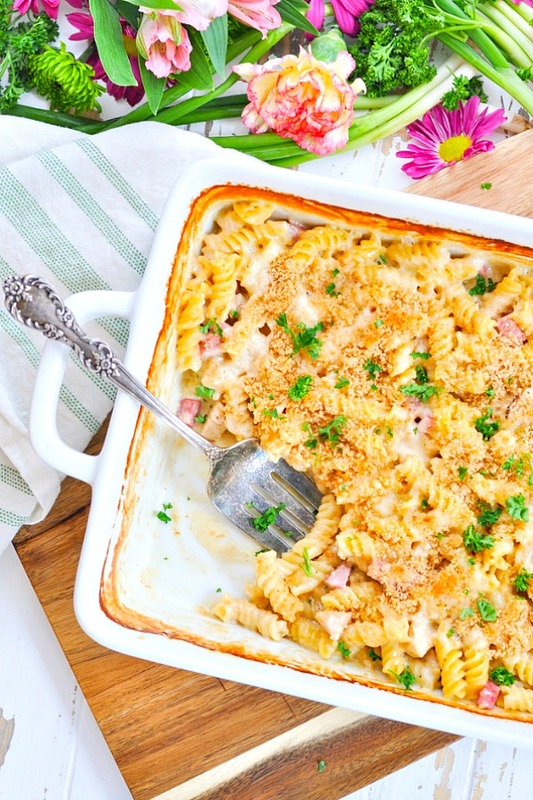 Just dump-and-bake for this easy 10-minute Chicken Cordon Bleu Casserole! 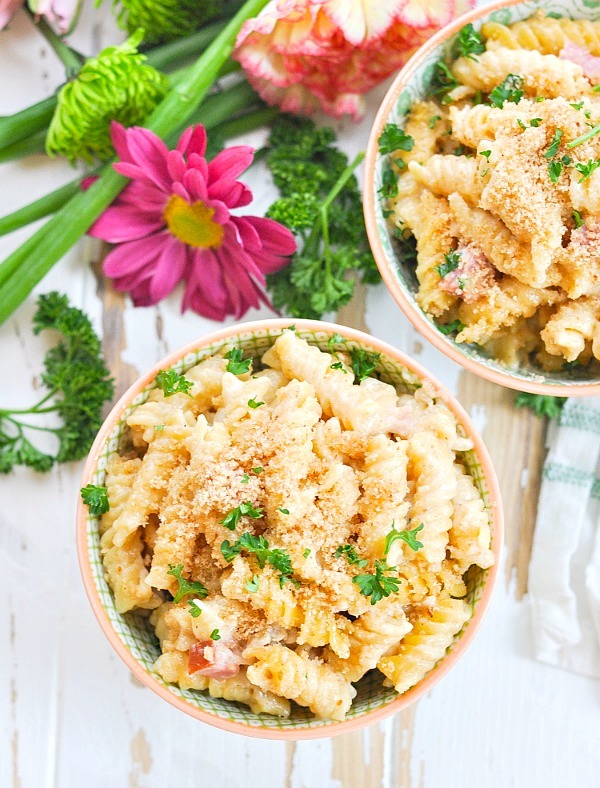 The creamy Swiss cheese pasta is loaded with chicken and ham, and finished with a buttery breadcrumb topping. 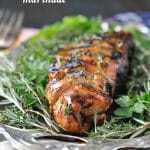 It’s a one-dish meal that your family will adore! When I was testing recipes for this year’s Easter ham, I found myself with a lot of leftover meat in the freezer! Ham sandwiches are delicious, but I needed to get a bit more creative if I was going to work my way through our entire stash. Like magic, my mind dreamed up this concoction…and it’s a keeper! 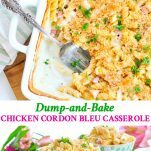 I took the classic Chicken Cordon Bleu from my childhood, and I gave it a dump-and-bake makeover. The original dish includes chicken wrapped around cheese, which is then breaded and pan-fried or deep-fried. Some versions also include a slice of ham in the filling with the cheese. The French term “cordon bleu” translates to blue ribbon, and has been used to describe food that has been prepared to a very high standard. In this case, I’ve eliminated the need to pound chicken breasts flat, to roll them with toothpicks around ham and Swiss cheese, or to coat them with breadcrumbs. Nope, I’m not doing any of that! Shall I walk you through this? and a little bit of wine (only if you like it). I’ve made this dish without the wine and it’s absolutely perfect, so no harm in leaving that ingredient out! You can just use additional broth instead of the booze. and some grated Swiss cheese. I used equal amounts of ham and chicken here, but you can certainly go with just one or the other (depending on what you have on hand). For instance, if you have a plethora of leftover ham, you can use 2 cups of the ham and omit the chicken entirely. Again, it’s up to you! When all of your ingredients are combined in the dish, it will look like this (i.e., a lot of liquid)! But don’t worry! Once you cover the dish tightly and bake it in the oven at 425 degrees F for about 45 minutes, the pasta will absorb most of the liquid. 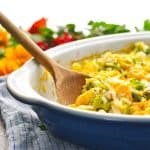 The sauce will be thick and creamy, and you’ll finish off your Chicken Cordon Bleu Casserole during the final few minutes with a sprinkling of buttered breadcrumbs. See? 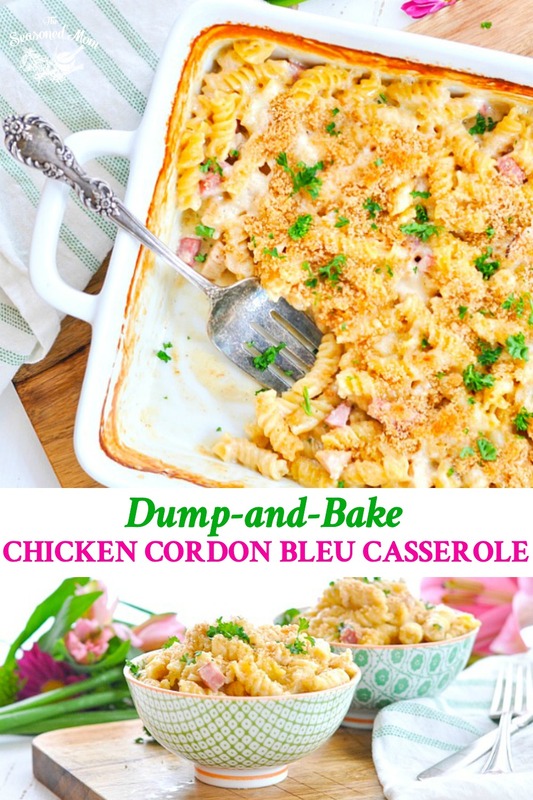 I managed to include all of the classic Chicken Cordon Bleu flavors into one easy dump-and-bake dish. You’ve got the chicken, the ham, the Swiss, and the breading…but none of the labor! 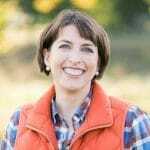 It’s the updated, busy-mom’s version of a classic, and I hope that you enjoy it as much as we do! I used equal amounts of ham and chicken here, but you can certainly go with just one or the other (depending on what you have on hand). 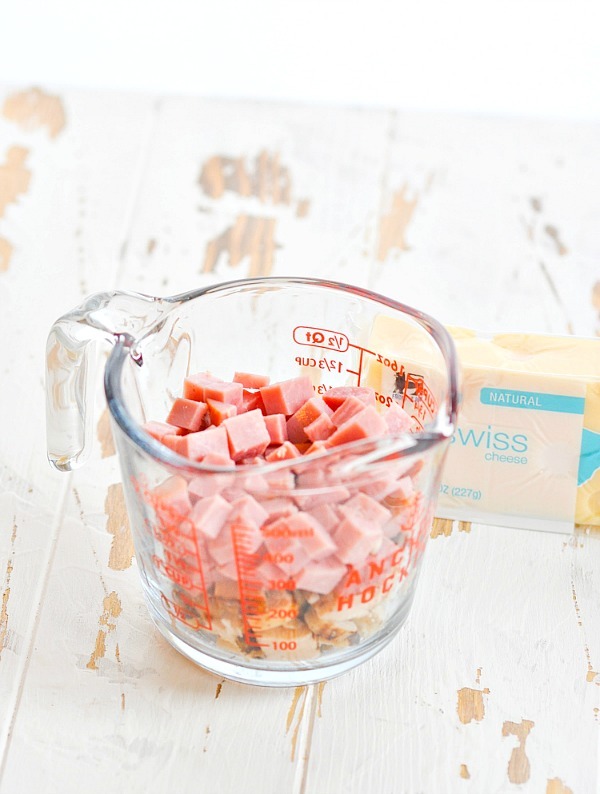 For instance, if you have a plethora of leftover ham, you can use 2 cups of the ham and omit the chicken entirely. 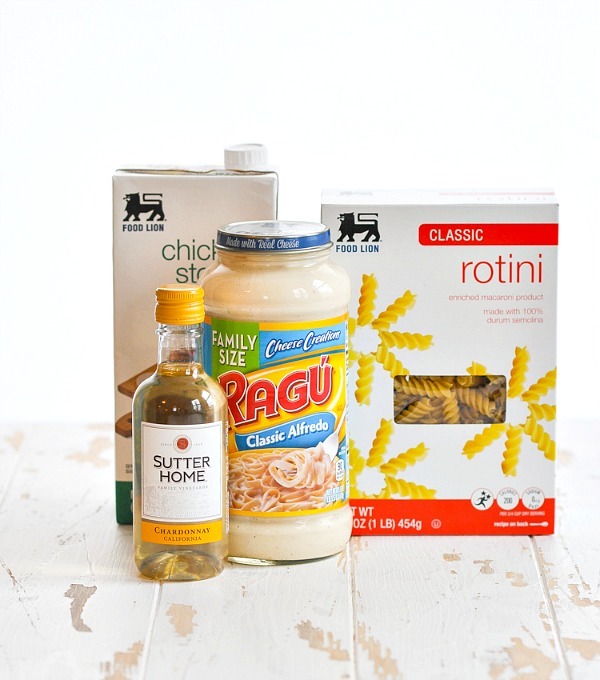 Use a large jar of store-bought Alfredo sauce, or use 2 1/2 cups of homemade Alfredo sauce. Skip the wine and use additional chicken broth, if you prefer. This is a great way to use up leftover chicken, but you can also just purchase a rotisserie chicken at the grocery store or use pre-cooked chicken such as Perdue ShortCuts. To add vegetables to the dish, try stirring some frozen peas into the pasta during the final 5-10 minutes of baking. 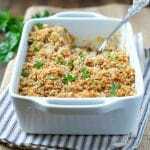 For a Chicken Cordon Bleu Casserole with Rice, try this recipe. 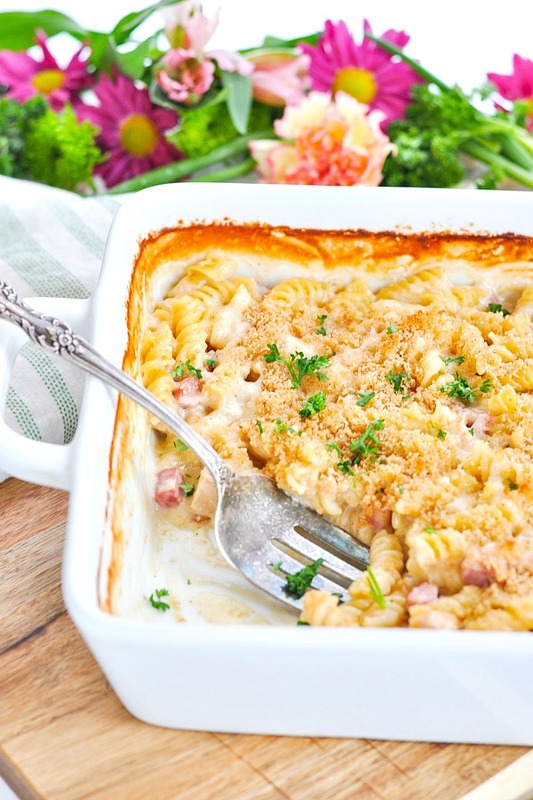 Instead of breadcrumbs, try making a Chicken Cordon Bleu Casserole with Ritz crackers on top! Simply crush the crackers until you have 1/4 cup of crumbs. 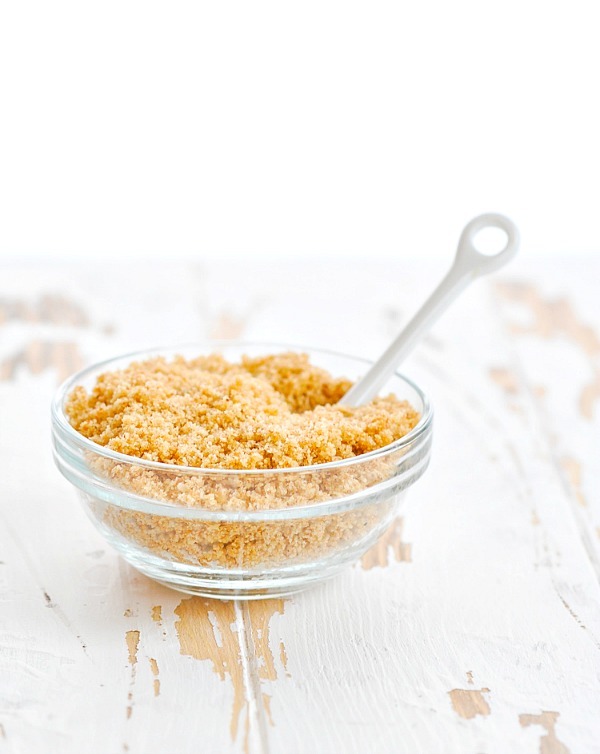 Toss the crumbs with 1 tablespoon of melted butter and use in the recipe, just like you would use the buttered breadcrumbs. Cooking for a Smaller Family? Cut the ingredients in half and bake the casserole in an 8-inch square pan. The cooking instructions and the baking time remain the same. 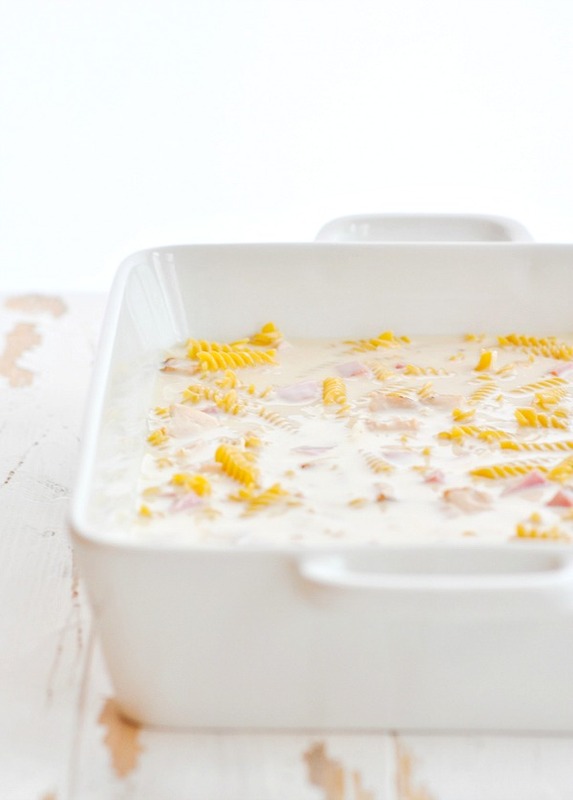 In a large bowl, whisk together Alfredo sauce, chicken broth, and wine until completely smooth and combined. 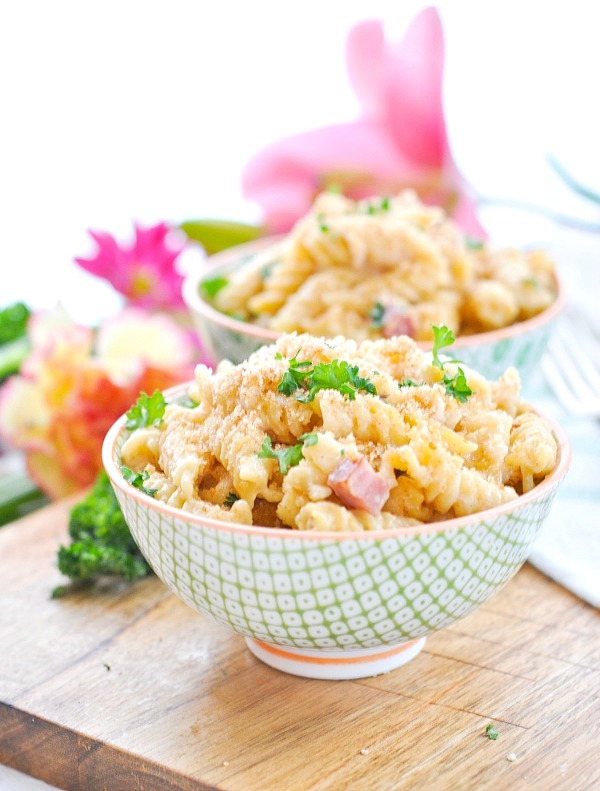 Stir in the uncooked pasta, ½ cup of cheese, chicken, and ham. Cover tightly with aluminum foil and bake for 40 minutes. Once pasta is al dente and the sauce has thickened, sprinkle remaining ½ cup of cheese over the top, and finish with a layer of buttered breadcrumbs. Bake uncovered for 5 more minutes, or until cheese is melted and breadcrumbs are golden brown. Ooh, this would be a huge hit in our house! Yum! 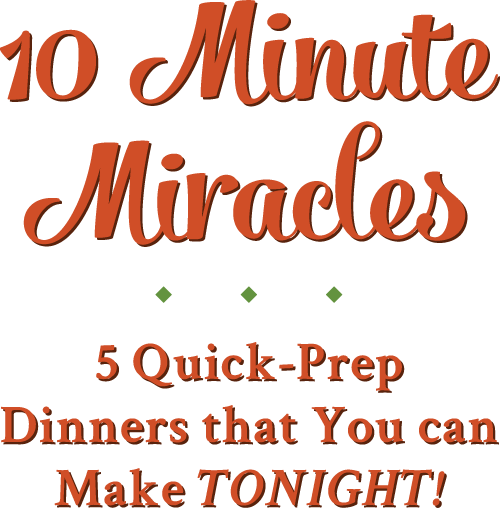 I love your recipes – they are simple and sophisticated, as well! My husband doesn’t eat ham. Is there anything I can substitute? Why don’t you try canned chicken or tuna? 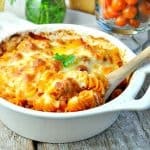 Make it a tuna/cheese or chicken/cheese casserole? Yep! Those would work as well! Thanks, Lindy! Can this be frozen , thawed and baked latter?